1. Make space - you must consider the conditions! Do not store your bridal gown in any part of the house where drastic changes in temperature or humidity occur. Also carefully check wardrobes and closets for any signs of damp. Avoid exposure to sunlight - this will discolour the garment if white, and fade if it is coloured. 2. Keep it safe – avoid storing your wedding dress in a plastic garment bag or in a vacuum-sealed bag. Plastic bags can yellow your gown over time and tightly sealed containers trap moisture, causing your gown to mildew. Natural fibers need to “breathe,” so it’s much better to use a breathable garment bag. 3. Place correctly - You can leave a not too heavy dress on the hanger, but always hang it by the loops located inside, never by the shoulders or straps because that can stretch the material. If your gown is really heavy consider storing it in a lying down position. If your dress has beading or embellishment always carefully check that no layers are catching on it to avoid pulls and tears. 4. Travelling - we suggest wrapping any delicate areas of the dress, such as an embellished bodice, with uncoloured tissue paper. If the dress must be packed, you can wrap the folds with tissue paper to avoid wrinkling. Don’t take it out of its garment and try to avoid folding it. Just roll it lightly. If you’re flying keep it with you as a hand language. 5. Unpacking and removing wrinkles - pull the dress out a few days before the wedding and put it back on its hanger with the train spread. Wrinkles will sometimes “hang out” by themselves. Hanging it in the steamed bathroom while the hot shower is on is also very helpful. Just be careful that the dress itself doesn’t get wet! 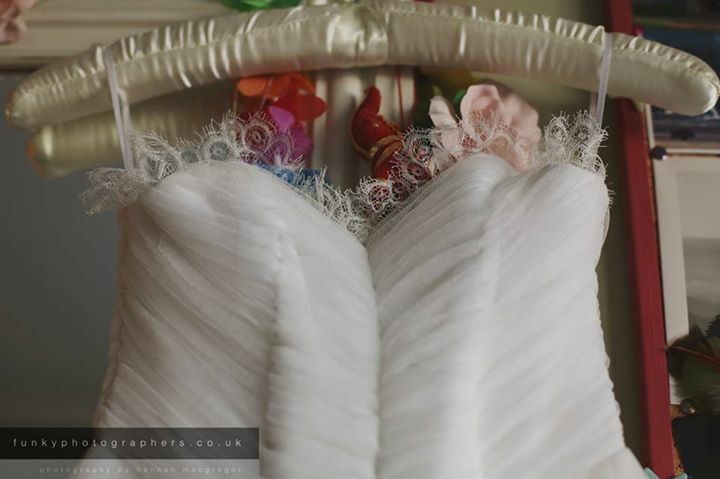 Make sure that the layers of crinoline under the skirt are also fluffed out and unwrinkled. NOTE: If your dress is from silk or is very delicate avoid steaming because steam can cause some silks to crinkle! A delicate dress that wrinkles easily calls for a specialist so it’s good to check local dry cleaners or at you hotel in advance. 6. Touching – it may be tempting to trying on dress on again and showing it to your close people, but too much touching isn’t good! Always wash and dry your hands first to avoid finger marks and do not have anyone with a fresh manicure or dark nail polish help with your dress!